The Mariinsky Theatre II neighbours the original Mariinsky Theatre (at left), which opened in 1860. Photo courtesy Tim Griffith. A rooftop amphitheatre will be used for summer performances set against a stunning backdrop of the St. Petersburg skyline. Photo courtesy of Tim Griffith. The main auditorium, with a horseshoe configuration, seats roughly 2000 patrons. At left, the upper lobby's long glass staircase and the backlit onyx walls of the auditorium. 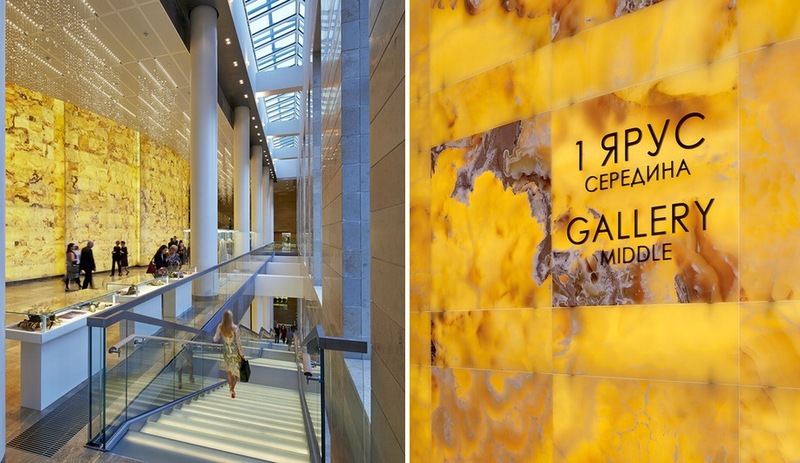 At right, a detail of the translucent onyx wall panels, with interior signage. Photos courtesy Tim Griffith. 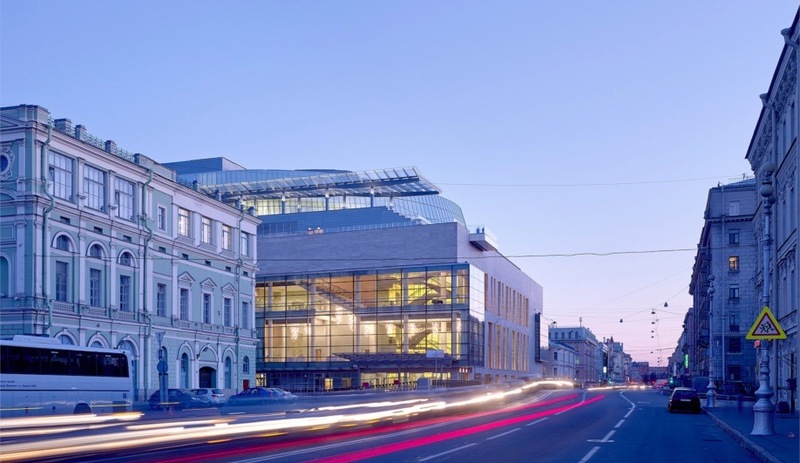 The New Mariinsky Theatre by Toronto’s Diamond Schmitt Architects provides St. Petersburg with Russia’s first major performance venue since the time of the czars. Standing next to the original Markiinsky Theatre, the new building is one of the largest performing arts facilities in the world, providing a state-of-the-art home with more advanced technological capabilities for the renowned institution’s ballet, opera and orchestra. 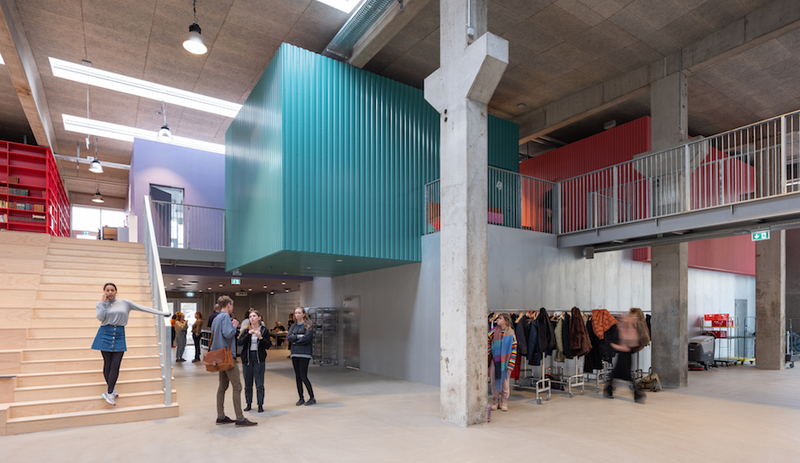 Its repertoire-expanding capabilities far surpass those of the original theatre, located just across a canal, which is unable to accommodate large set performances. 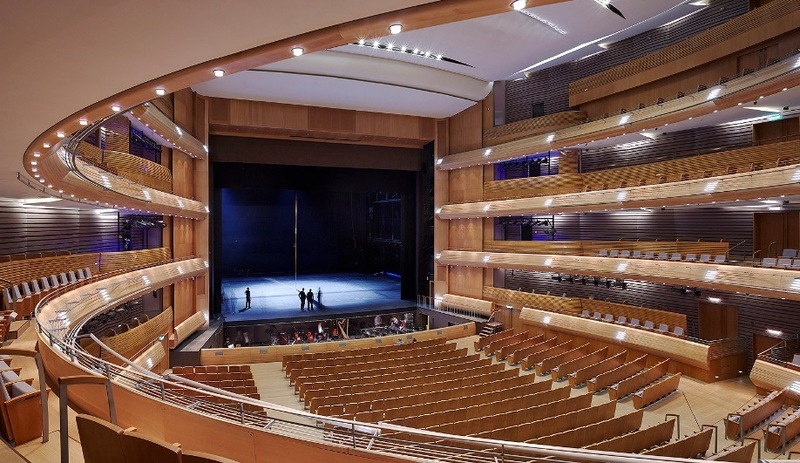 Besides offering a world-class stage, Mariinsky II will both frame and provide a viewing platform for the old building, set to close for several years of renovation. But the completion of a project of this massive scale (Mariinsky II racked up a bill of $700 million) is seldom smooth. In fact, Diamond Schmitt’s scheme replaced a design by Dominique Perrault, who won the initial competition in 2003. 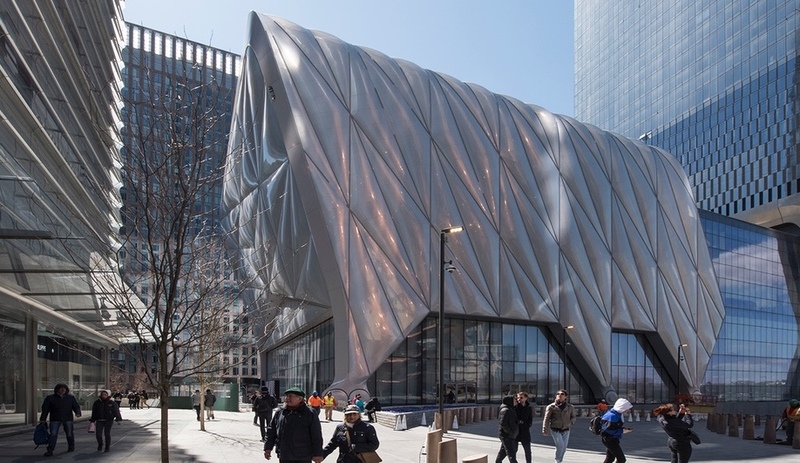 Perrault’s “golden cocoon” was found to violate several building codes, and was modified beyond recognition. The plan was then further complicated by the discovery that the soil beneath the construction site was “unpredictable” – soft as cream cheese. Diamond Schmitt boast an impressive portfolio of major halls in Montreal, Washington D.C., Detroit, and Toronto. The last city is home to the fully glazed Four Seasons Centre, which the Russian planning team credits with earning Diamond Schmitt the Mariinsky contract. Though Mariinsky II’s design has earned praise from all quarters, it is not without its critics. Some have compared the facade, which doesn’t strictly replicate the 19th century aesthetic of its neighbours, to that of a ubiquitous shopping mall. But this contemporary facade belies a close adherence to the function of the district’s pre-existing architecture. Large bay windows of structural glass replicate the classically columned porticos used to identify entrances in historic St. Petersburg architecture, proportioning the building and breaking up the continuity of the streetscape in the same fashion as more traditional local structures. Yet, Mariinsky II is set apart from its neighbours with a gently curving metal roof, injecting some 21st century fluidity into the otherwise orthogonal streetscape. plaster accents and walls of backlit translucent yellow onyx. The auditorium follows the horseshoe model of opera houses from the 18th and 19th centuries, with three balconies and 2,000 seats, all with impeccable sightlines. 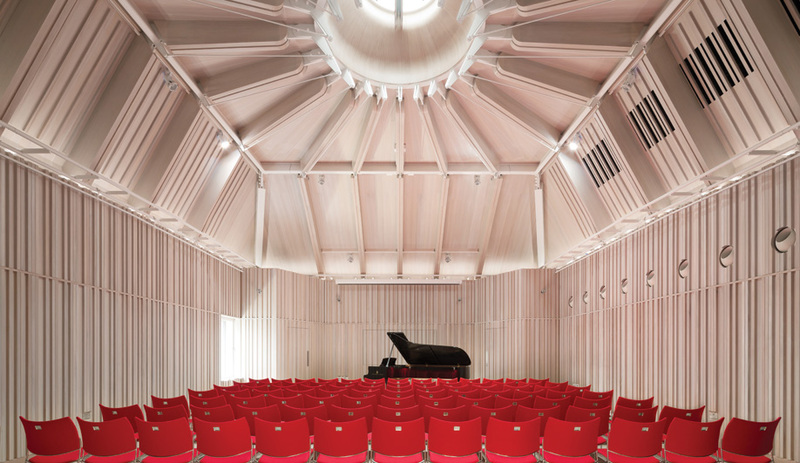 The beech wood that lines the walls and balcony fronts, and the oak parquet flooring, contribute to unrivaled acoustics. Contrasting against these finishes, a darker rear wall draws all attention to the stage and heightens a sense of intimacy with the performers. 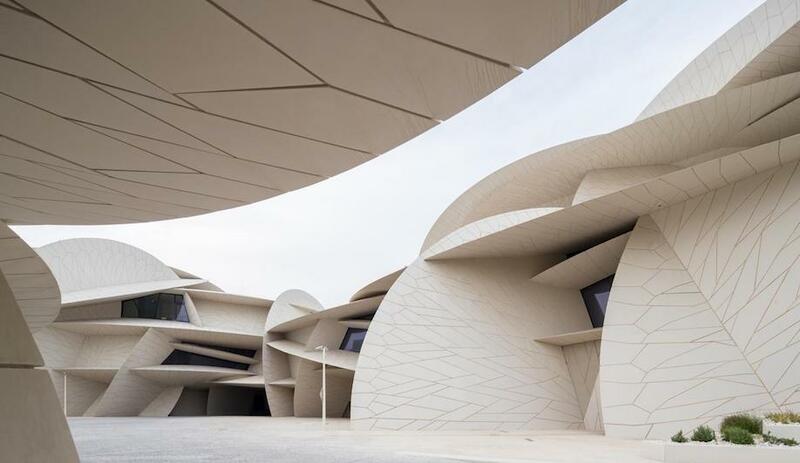 Backstage, the 53,000 square metres of practical space includes three fully stage-sized rehearsal rooms for the opera, ballet, orchestra and chorus; and dining and production facilities for 2,500 staff. 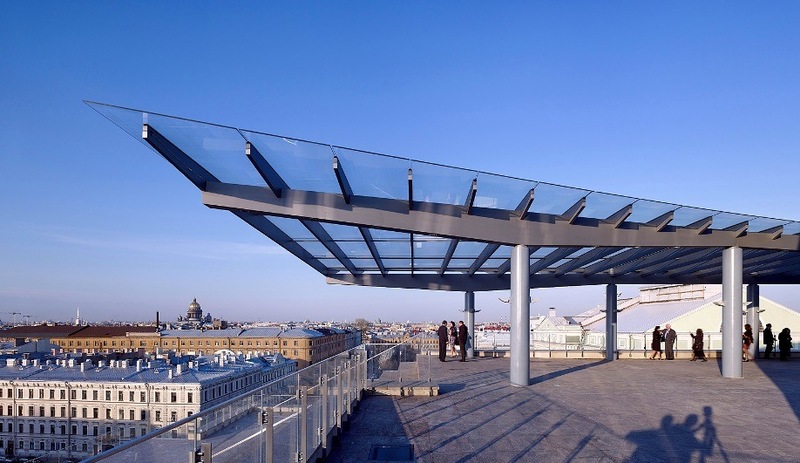 Diamond Schmitt included one final modern touch sure to resonate with theatre-goers: the rooftop amphiteatre, which will provide outdoor summer performances set against the backdrop of the rarely-seen St. Petersburg skyline.